By all accounts, Blackbeard was a beast among men – towering over his contemporaries, and piratey to the core. Well, this new collectable figure from Sideshow Collectibles is no different. Standing at a whopping 19 inches, and with a scowl that could melt granite, this rendering of Blackbeard is truly the meanest, pirateyest thing to come across my desk in some time. Striking a “Captain Morgan” pose atop a demolished cannon (which he probably head-butted), Blackbeard stands poised for a moment to catch his breath between slaughterins. His blade is drenched in naval blood, while his enormous flintlock (actually, a doglock I believe) stands ready to bring a quick end to the next bloke that looks at him funny. 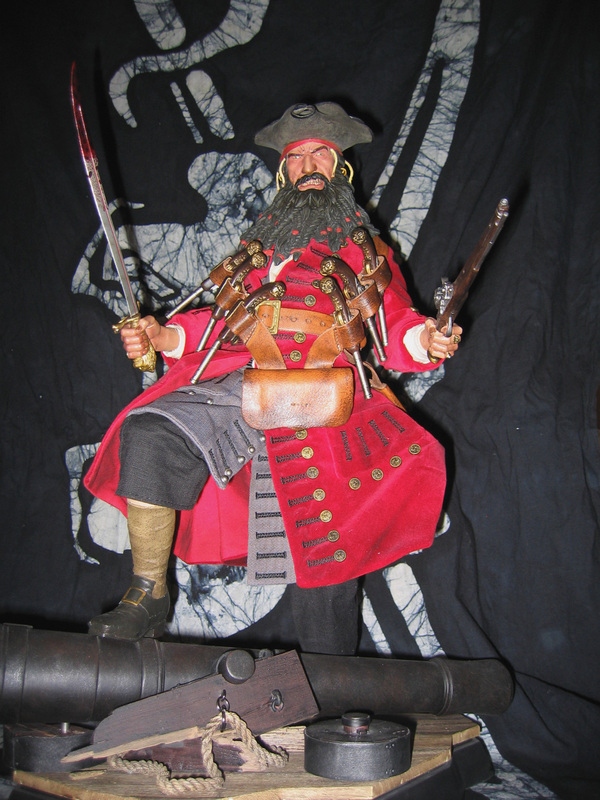 All together, this statuette captures a moment of Blackbeard’s life that not only sums up his own legend, but pretty much defines the legend of Caribbean piracy in its entirity. It’s not just that this figure is huge – and heavy, for that matter. No, what makes this a marvel is the extraordinary attention to detail – velvet coat, fabric vest, LEATHER ammo pouch – yes, actual leather. And the fine details – words can barely do them justic – so I won’t try. Instead, let’s do a little comparison. Below are two pictures – the first is one of Blackbeard’s six Queen Anne pistols included with this figure, which he famously wore around his neck in combat. And just beneath is one of my own actual Queen Anne pistols – full sized and fully functional. As you can see, the craftsmanship here is absolutely superb. From head to toe, Blackbeard is an intimidating, piratey sight, and one that will command attention in your parlor, bar, livingroom, or where ever else you should choose to display him. 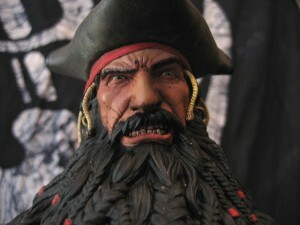 This entry was posted in Other and tagged bilgemunky's favorites, blackbeard, sideshow collectibles by Bilgemunky. Bookmark the permalink.